← Cute Dog Pics for Your Monday Blues! 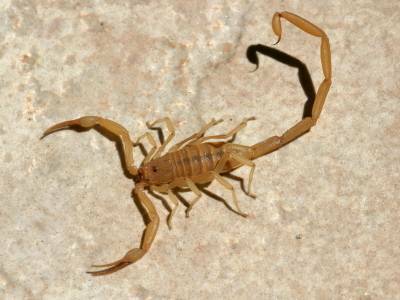 Things look bigger when they are seen through your eye from a quarter inch away, and a scorpion, waving its tail in anger is no different. Now I’m generally not one to panic unless it involves a spider; however; imminent sting by bark scorpion on the eyeball apparently is now added to the list. In panic I swatted away the scorpion, along with my glasses. I have 20/600 vision, so things 20 feet away appear 600 feet away. Basically, without my glasses all I see are colors. A much more impressionist view of the world than even Monet when he was going blind in his later years. So, I tried to feel around for my glasses blindly, hoping I did not put my hand on the scorpion. I found my glasses as I fell over the coffee table, making the fake portion of my leg and hip bend backwards against the real part of my bone. (I have osteonecrosis from asthma meds, so I’m an android now, a topic for later…). This hurt. By hurt, I mean pain on a scale of 10 of 10, yelling out screaming, can’t put any weight on my left leg. The spiky part in the marrow of my bone hurts like you would think. The top I also have mesh and other junk in me. That is what the scorpion twisted out of place. Crawling now in pain, desperately looking for the scorpion now that I’m re-equipped with glasses for vision, I can’t find it. 20 to 30 minutes, still can’t find it after moving everything in my living room. I have removed all clothing except my underwear and combed my hair several times and looked in the mirror to make sure it is not still crawling on me. Finally, I decided to crawl myself, up to a chair and sit down. 5 minutes later, I see a scorpion. I’m not really sure if it’s the same one, but I hope it is. In my haste to swat it off my eyeball, I failed to remark any distinguishing features. I stagger across the floor, yelling in pain, grab the flyswatter, reach the offending arachnid and swat it as hard as I can. It’s on carpet of course, and I hit it so hard, if flies away to God knows where. I repeat my early search and hair combing. Nothing. I decided to go to bed at some point, not knowing for sure. I woke up unable to walk. Percocet here we come – prescription of course. It took several to stand even with my cane. I planned on skipping work, but events kept me from it. Letting the dogs out, I look around and see a dead scorpion on its back on a dog toy. I pick up the toy, dust the carcass into the trash and hope it’s all been the same scorpion. Thank God for modern pain killers. Seriously, Percocet, Oxycontin, Morphine and Dilaudid make bone death bearable. My day at work was painful. Sadly, an understatement. Midway through I began to wonder if I had just aggravated my bones or actually broke something. Driving home I forced myself to concentrate on the road, not the pain, which was harder than I thought it would be. The good news is my leg is finally feeling better and there were no more visitations by the little sting tail demons tonight.